Researchers in laboratories are constantly dealing with dangerous, toxic chemicals. FireflySci has released an innovative new cuvette rack that will make a scientists job easier and safer. FireflySci, Inc., located in the heart of Brooklyn NY has been working with chemistry and biology labs across the globe for over 10 years. FireflySci is a cool and trendy cuvette manufacturer with a wealth of knowledge in the spectroscopy field. They have manufacturer custom flow cytometry cells, particle sizing cells, and hematology flowcells, for some of the biggest names in the industry. The R&D department at FFS was astonished to find that researchers are damaging cuvettes on a daily basis due to mishandling. The research conducted showed that lab accidents involving a cuvette were caused mostly by cuvettes being accidentally knocked over. 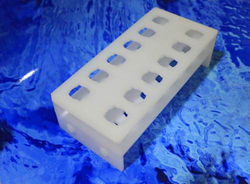 To solve this problem and prevent the breakages from happening, FFS has come up with a Cuvette Rack that offers scientists a huge list of benefits. It doesn’t take much effort to make an expensive cuvette tip over. Just a simple brush of the sleeve and a researcher can say goodbye to their sample and perhaps their $300 cuvette. The FireflySci Cuvette Rack makes it impossible to accidentally tip over a cuvette. With a large base size of 5.25 x 2.5 inches, it offers an incredible stable place to place a quartz cuvette when filling rather than relying on the small 12.5 mm base of the cuvette. The FireflySci Cuvette Rack is able to hold up to 12 standard 10 mm cuvettes. Having all the cuvettes in a line gives a researcher the ability to rapidly fill one cuvette after the other. This drastically cuts down on cuvette preparation time and increases efficiency. Also, this design allows scientists the ability to see all their cuvettes at one time to make sure everything is perfect before the experiment starts. The Cuvette Rack is also perfect for cleaning quartz and glass cuvettes. To properly clean a cuvette they must be rinsed, soaked, rinsed again, and then left to drip dry. The Cuvette rack is great for drying since the bottom of the rack is open so liquid can easily drain out of the cuvettes. A waste bin should be placed under the cuvette rack to catch any waste materials. Another common problem that people run into when using cuvettes is getting scratches on the optical windows. These scratches can be very serious, because if a scratch is interfering with the light path, then the data will be incorrect and worthless. Scratches can easily be prevented by using the Cuvette Rack. The material that FireflySci used for this rack is polyethylene which does not scratch quartz or glass. Keeping cuvettes in the rack also keeps them off the work bench where they can become contaminated. FireflySci Inc. is pumped about this awesome Cuvette Rack hitting the market. The production line has made a large lot of these racks to make sure they are available for every labs that needs them. For more information please visit http://www.fireflysci.com.